Small group of Corn Buntings gamely tried perching up, while the Fieldfares and Mistle Thrushes kept low in the furrows. 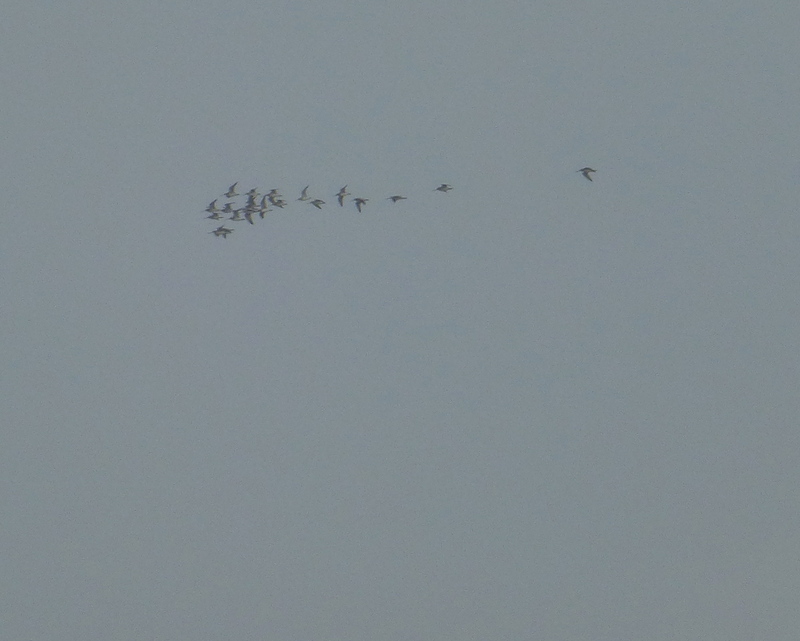 About 500 Pink Feet in the fields around Plex Moss Farm and a flock of at least 100 Linnets. 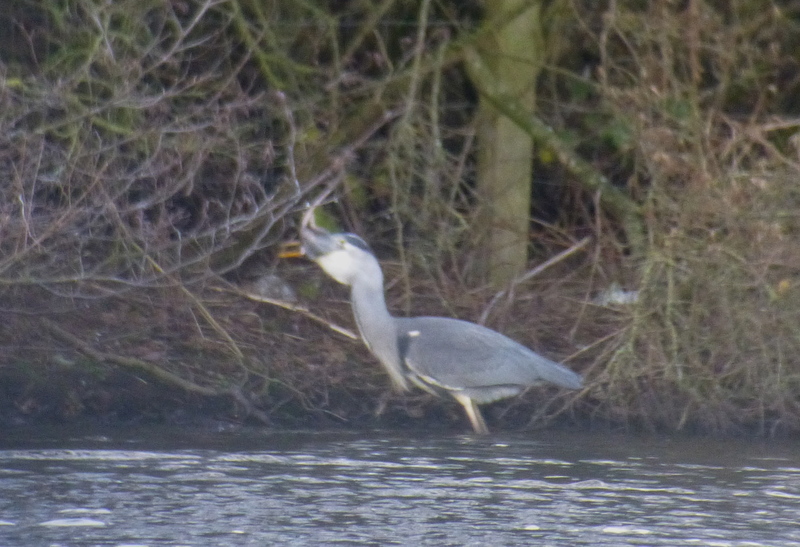 Little Egret on the Withins was unexpected, but not without precedent. A quick look at Marshside was hardly encouraging – although good numbers of birds were still on Marshside One aka Rimmer’s Marsh, the roar of the traffic felt particularly annoying today, so after a gander at the Pochards on the Sandplant lagoon, and usuals out on Marshside Two, I drove over to Mere Sands. 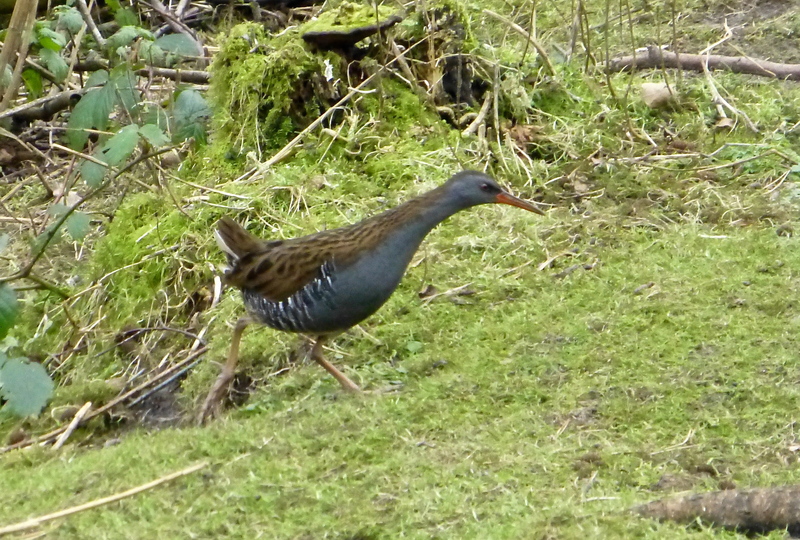 The feeders there were busy – but I wasn’t expecting a Water Rail to wander out in front of me – the freaky sprinty thing was as startled as I was and volte faced back into cover in the time it took me to fire off a point and press shot. A male Sprawk was terrorising the Tree Sparrows, finches, titmice and buntings, but they soon emerged from the branches once it had swept through. I love the deafening silence that follows a passing Sprawk, just before all the potential din-dins decide it’s safe to call again. 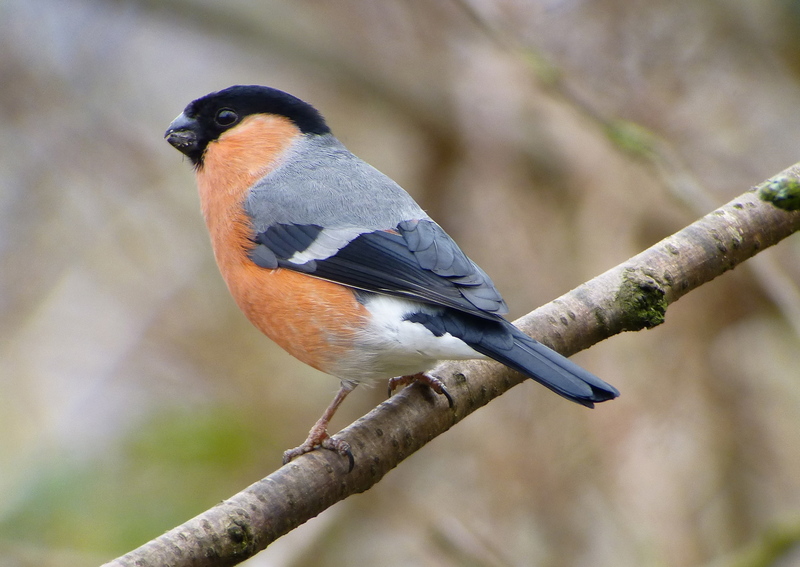 Bullfinches were a pleasure to watch there, with at least four birds coming in for seed. Goosanders and Goldeneye on the water, and the winter skellingtons of oak trees looking stark and superb as I wandered round. Nuthatch, Treecreeper and Greater ‘Pecker were most woodlandy. 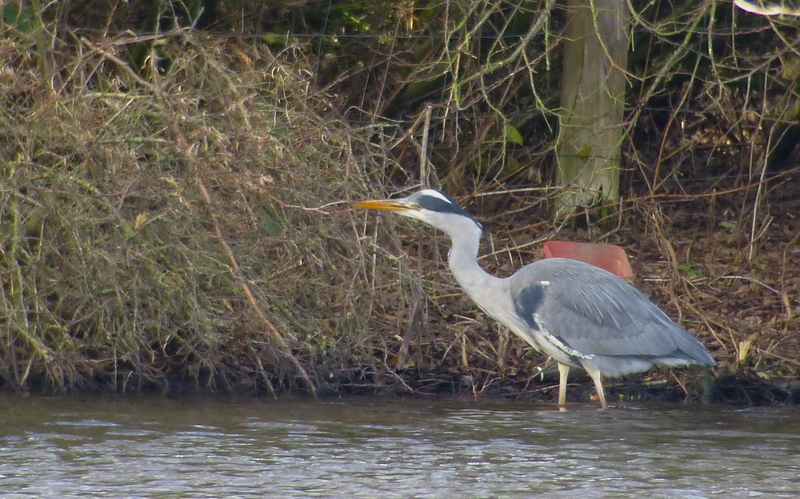 Popped into Martin Mere for a chat with Andy Bunting – all very Whooper-duper. Churchtown Moss had Fieldfare, Redwings and Mistle Thrush amongst the feeding Starlings and about 20 Corn Buntings. Lovely big high tide though it was yesterday, the mist and murk descended all too quickly at Ainsdale, so that a lunchtime seawatch was largely pointless – between 10-20 Great Crested Grebes, 8+ Red Breasted Mergs, 1 Guillemot, 3 Red Throated Divers and a few small rafts of Common Scoters close in, but shrouded in sea frets. Large numbers of ’em were moving south through the bay earlier in the morning, but the megaraft is still fractured into smaller groups after the recent storms. Plenty of Barwits etc displaced by the 10.2m tide, and moving south in the fug. Even more elusive was the super sneaky Snow Bunting down at Hall Road and still playing hide and seek (but mainly hide) despite the prolonged stay. On the upside, can I recommend a quick download of this latest report from Natural England I found online? Nothing startling, but excellent data crunching from a number of sources on the status of the commoner seabirds in the UK outside of breeding season. And it’s free, so what’s not to like? Next time I start trying to look wise and begin nodding sagely when someone says: “Well, we haven’t really had a winter yet this year”, I’ll remind myself about this afternoon. It was the day winter came to say hello. A brutally biting north westerly showed no mercy on the fields at Hundred End and Banks, when I called in to look at the swan flock – it was my own fault, next time I’ll wear gloves, thermals mebbe a hat or a coat, possibly even billies. Luckily the swans were fairly close to the road today and while I didn’t get a clear view of the whole flock, at least I could shelter in the lee of the wheels. 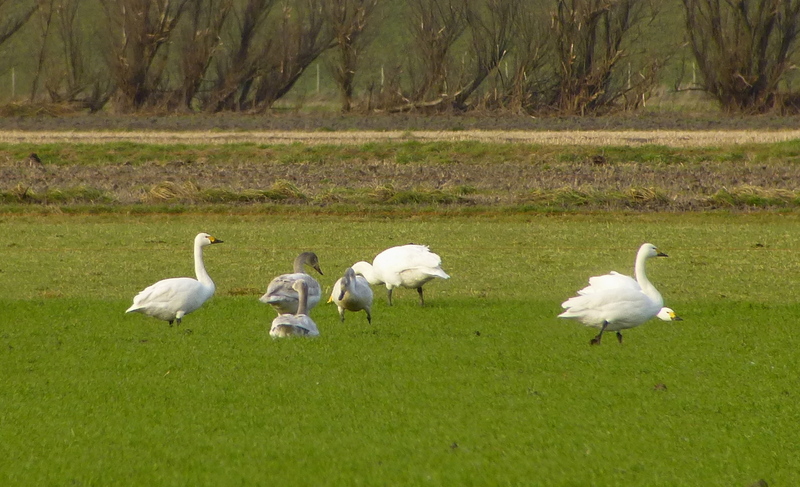 Counted 176 swans, mainly Whoopers of course, but at least 20 Bewick’s, probably more. Always strange to think that 40 years back the Bewick’s were the commoner swans on Crossens Inner and Marshside Two, and then, I longed to see a Whooper! 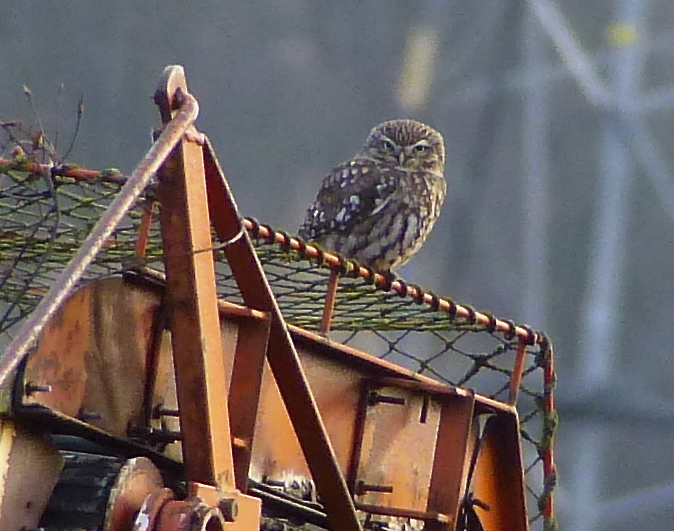 Common Buzzard flapped through while I scoped the swans and a few finch flocks, but it wasn’t long before I wimped out and headed inland with the car heater on full. Stopped off to say “Happy New Year” to an old friend at a well-known Little Owl stake-out before turning back to the coast and Southport Marine Lake. Pretty nippy at the Marine Lake too, but only 5 Goldeneye at the top end including the two adult drakes. 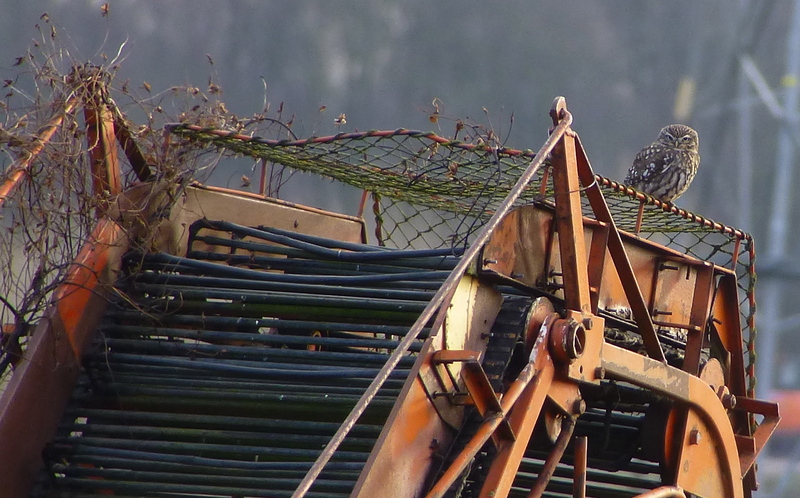 The Twite flock was on the west side commuting between the seaward parking strip and the foreshore. A count of 11 Little Grebe was the best I can remember managing here – the birds were in two flotillas. No sign of last weekend’s drake Scaup though. A very quick scan over Crossens Outer was tough too, but at least Peregrine and Pinkies stuck their heads up against the snow-dusted Pennines as the afternoon light faded. 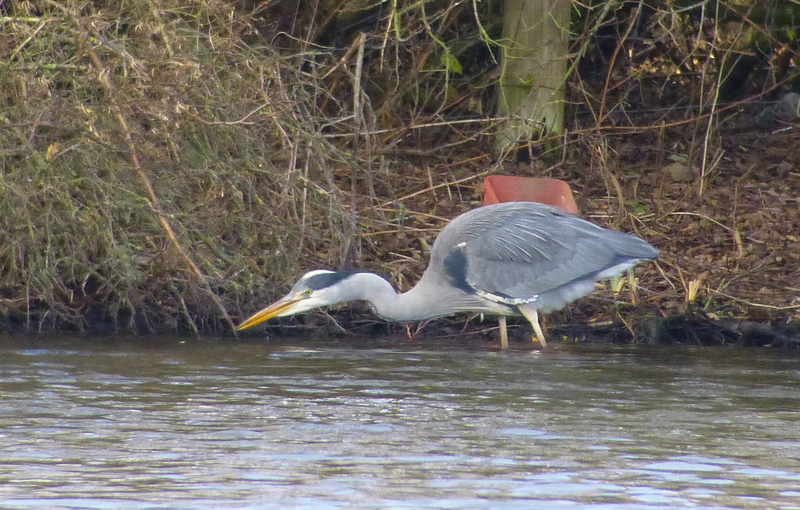 Admittedly, it wouldn’t be my first choice of lunchtime menu, but I came across this Grey Heron trying to ram the biggest Brown Rat this side of Gotham’s darkest sewers down it’s maw on Sands Lake at Ainsdale today. 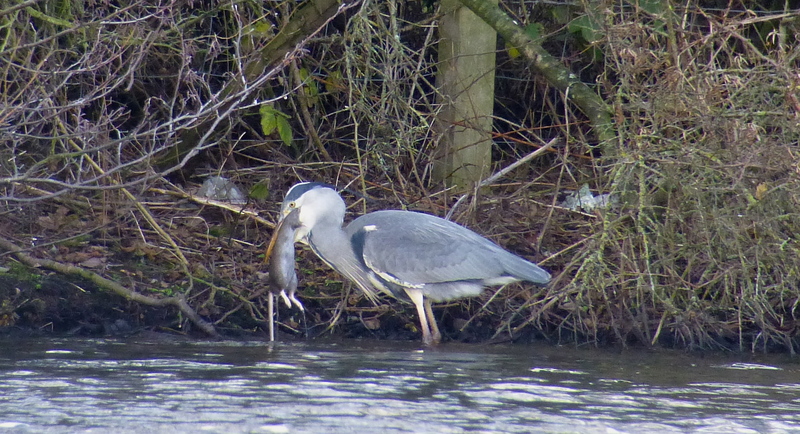 Don’t know whether the heron had killed Ratty, or was just attempting to snaffle some carrion, either way it proved something of a challenge. 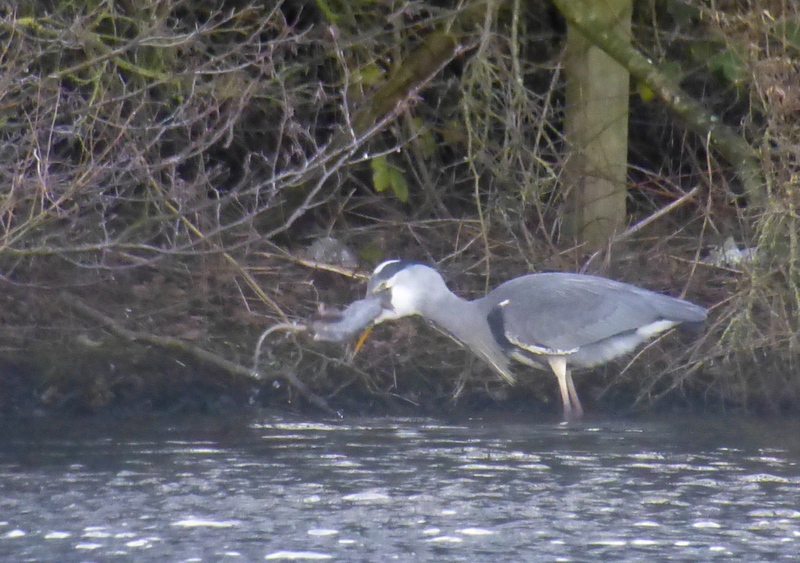 When this failed the heron would dump the rat and wander off to clean its bill on overhanging branches, like a Blackbird wiping its beak on wet grass after snarfing a worm. Then it would repeat the grisly process. By the time the wall of shredding, hissing, sand at Ainsdale gave way to driving sleet this afternoon, the alternative 13 hour round trip drive to Aberdeen was beginning to look decidedly appealing. 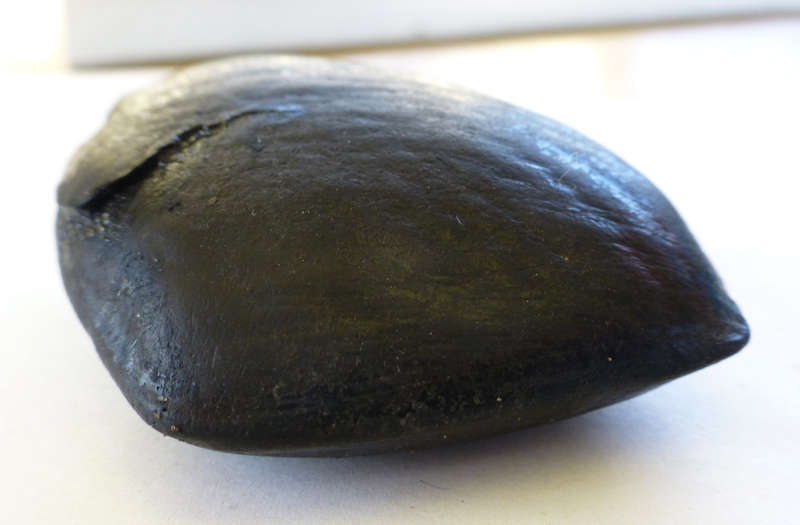 The mountainous swell of Liverpool Bay was boiling with white water this afternoon, and it was impossible to lock onto anything over the tide at Ainsdale, so I quickly gave up and went to check the edge of the tide, hoping for more big score after I found a seabean there on Thursday (more on that here). No luck, and not many gulls facing off to the screaming westerly either, so I headed up to Weld Road, via Sands Lake (two drake Pochards). There were certainly more gulls at Weld Road (1-2,000), but most were sheltering in the saltmarsh, and as I wasn’t prepared to flush ’em, I left them in peace. On to Southport Marine Lake, which had a drake Goldeneye at the north end, adult winter Med Gull and Twite and Linnet around the north west dune remnant. Little Egrets flapping into the roost from 1500 onwards, often hassled by gulls. 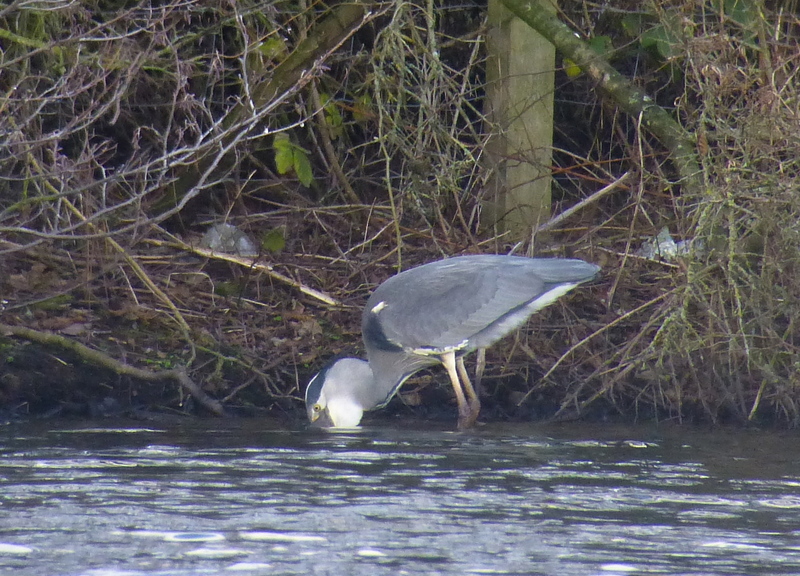 As the light faded, a first winter Herring that sailed past (pic at top of entry) had me double taking, especially as it had what appeared to be dark underparts, but there wasn’t enough black in the tail – and too much on the bill – to pursue it as it disappeared towards the southern end of the lake. Light went quite good for my first seawatch of 2015 at lunchtime – the murk lifted and the total cloud cover meant visibility was reasonably sharp off Ainsdale for an hour or so over the high tide, with no nasty sun bouncing off the waves. 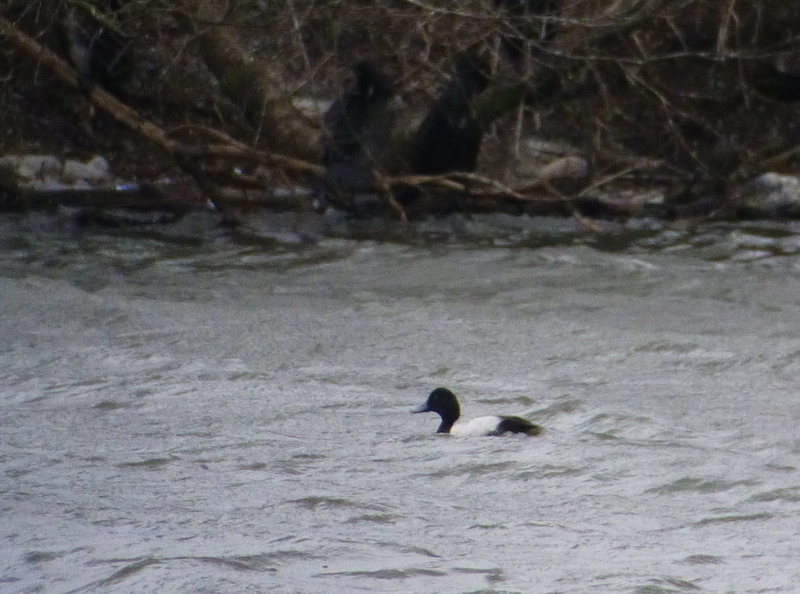 Big troughs and a meaty force 5 SWly meant it was really a game of very cold hide and seek though – remnants of the Common Scoter carpet rose and fell on the mountainous swell, and the usual divers and grebes were invisible. 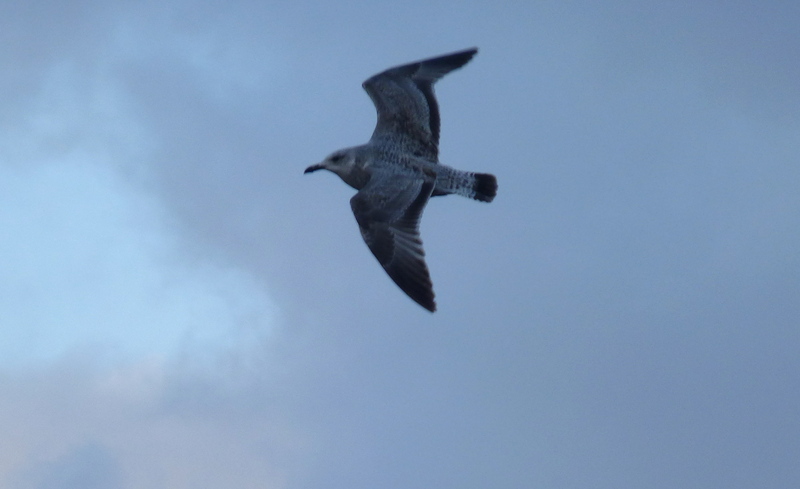 Highlight was undoubtedly a crisp adult Gannet that swept in close inshore from out of the south west before drifting off north – a good early date for one on the Sefton coast (I think the earliest I’ve seen in this part of the world). There’ll be others in a month or two. Hardly the Bridges of Ross, but the Gannet was one more genuine seabird than I’ve seen for a few months, and all the more welcome for it. With the mega-hooley looming in the forecasts, one hopes more may be on the way…. 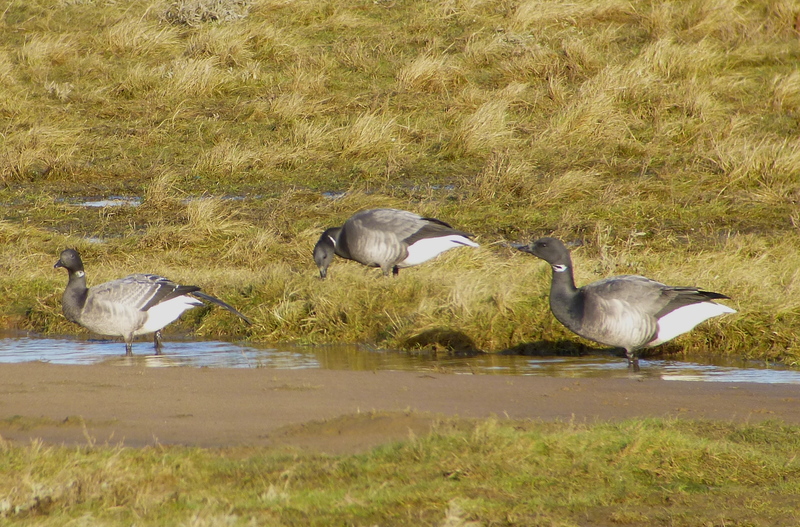 High wind and hard winter sun meant I just couldn’t pick out the Black Brant from the grazing Brents at Donna Nook in Lincs over the New Year – a shame, although this latest incompetence made a change from checking through Pinks. 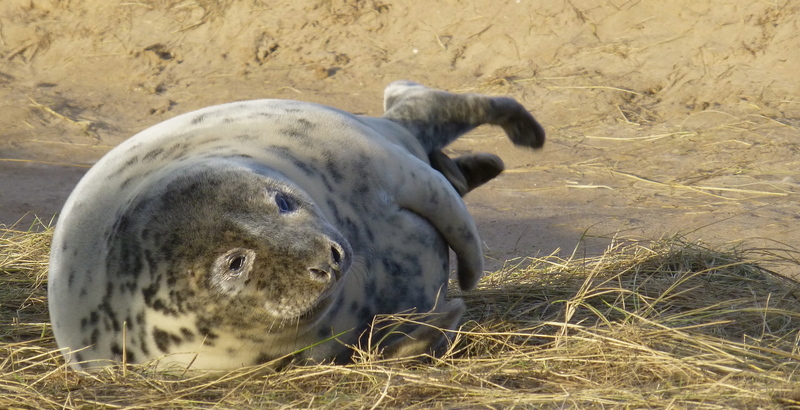 The GBBs at Donna Nook marauded Shelducks and Brents rather than the unfortunate Wigeon on the Ribble, but the Grey and Common Seals the site is famous for were oblivious, despite the fact the big gulls were tucking into seal calf carcasses at a few spots on the sands and in the saltmarsh. For those partial to great big sausages hauled out on the sand, I’ve posted a gallery of ’em here. With the New Year hootenanay finally over, I welcomed the chance to walk the seawall at Hesketh Out Marsh this afternoon – crisp and frosty, with shotgun blasts echoing into infinity, but still Kingfisher, Marsh Harrier and a few Common Buzzards. 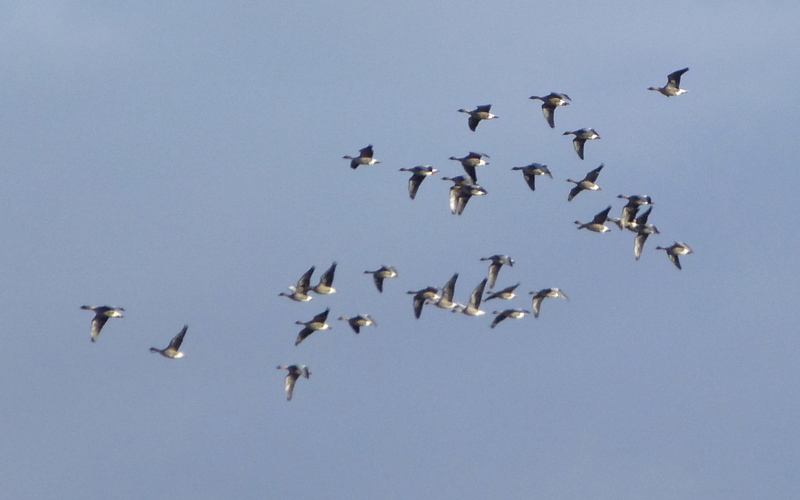 Nice flock of feeding Mipits and Pied Wags too in the fields. Up to 200 Whoopers were grazing south of HoM, but the low sun was directly behind them, making it super-tough to scour for Bewick’s…there’ll be other days no doubt.